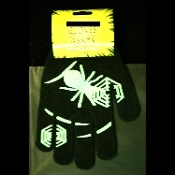 Great for Witch Black Widow, Biker costume, etc! 82% acrylic, 17% polyester, 1% spandex. 70% acrylic, 23% polyester, 6% rubber, 1% spandex. Do Not Bleach. Dry Flat. Do Not Iron.